Jumping rope is a vigorous and effective cardiovascular exercise. Many athletes jump rope as a warm-up or as part of their workout routine. Jumping rope can be done just about anywhere. Plus, it can burn over 600 calories an hour. You can make your own jump rope so you can customize the length, weight and materials. 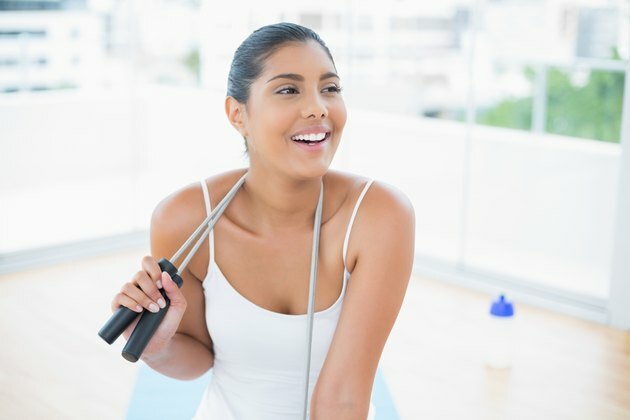 A homemade jump rope will also save you money over a store-bought one. Choose from ropes made out of plastic, leather or nylon. You can buy most of these at a hardware store. Leather ropes tend to swing faster, but they can also sting if you accidentally hit yourself. Choose a material that is comfortable for you. Decide if you want beads covering your rope. Adding plastic, rectangular beads adds weight to your rope, making it easier to swing. It also makes a noise each time it hits the ground, which can make it easier to count. You can buy beads at a craft store. Measure the length of the rope. A good rule of thumb is for a jump rope to be twice as long as the distance from your feet to your armpits. Stand on the center of the rope with both feet and pull each side up to your armpits. Cut the rope on each side. String the beads on the rope, if you decided to use them. Add a plastic handle to each end of the jump rope. You can buy handles at craft stores, or you can cut a 4- to 5-inch piece of 1/2-inch PVC pipe. You can also buy weighted handles from a sporting goods store, which will make turning the rope feel heavier, so you get a more challenging workout for your upper body. Secure each end with a strong knot. Test the jump rope. It should feel comfortable and easy to move. If you keep tripping over it, it may be too long. You can easily adjust the length by untying the knot and shortening the rope.